Don't have time to decorate a gingerbread house? Trim a sweet tree instead! All you need is a little frosting, ice cream cones, and sprinkles. 1. Carefully spread the frosting on the ice cream cones to cover all sides. 2. Pour the sprinkles onto a plate and roll the cones on all sides. You can also sprinkle them onto the frosted cones straight from the jar. 3. 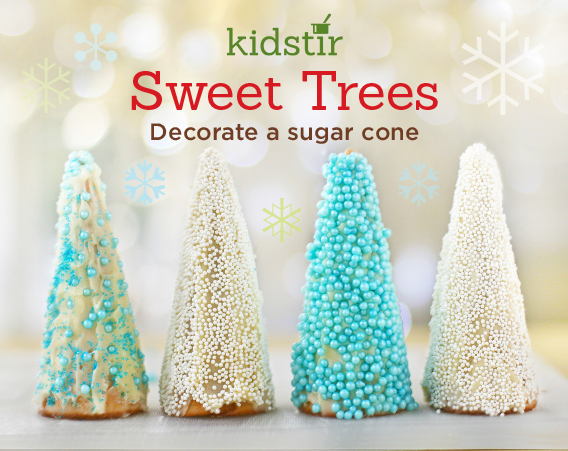 Display the tree treats for a sweet decoration or eat them up as a dessert.